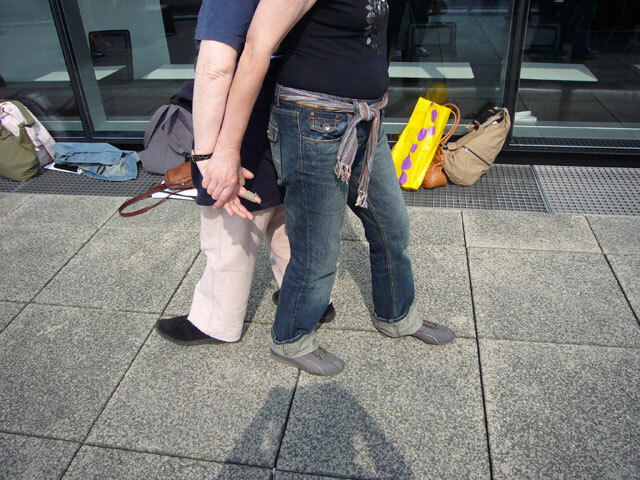 Introduce themselves to their walking partner, whilst continuing to walk. 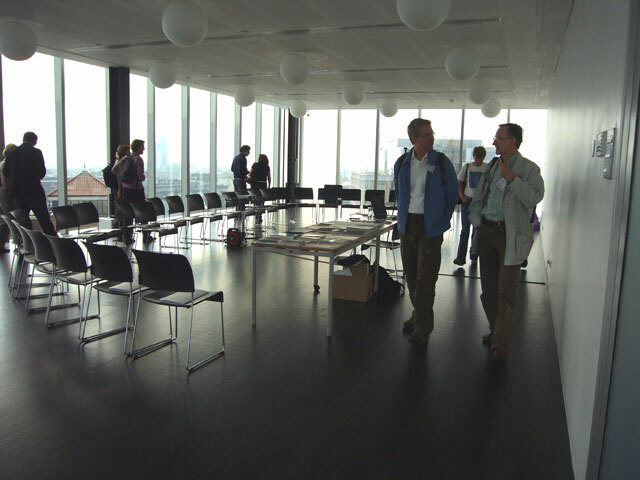 Once all the participants had arrived and there was a continuum of waking couples circling the room, participants were invited to take a seat and to present their walking partner to the group. There is a very nice mix of people of different ages and backgrounds, working with photography, painting, installation, live art, sound, and writing. 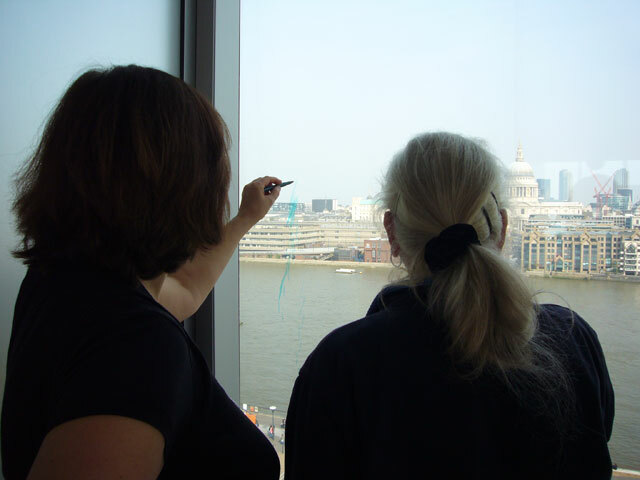 There was a shared passion for walking (both in rural settings and in the city), and many people spoke of London as an inspiring place for art making. Please use the comment box at the foot of the page, to present yourself again to the group, and perhaps tell us a little bit more about your background and interests. You can also share your thoughts on this exercise. 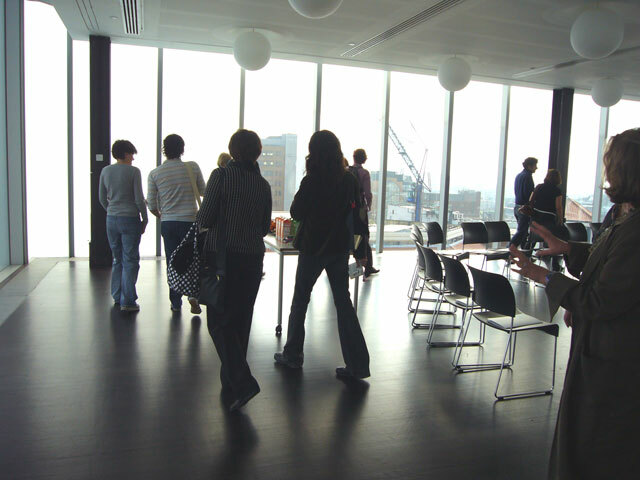 After the introductions, we moved straight into our first exercise. 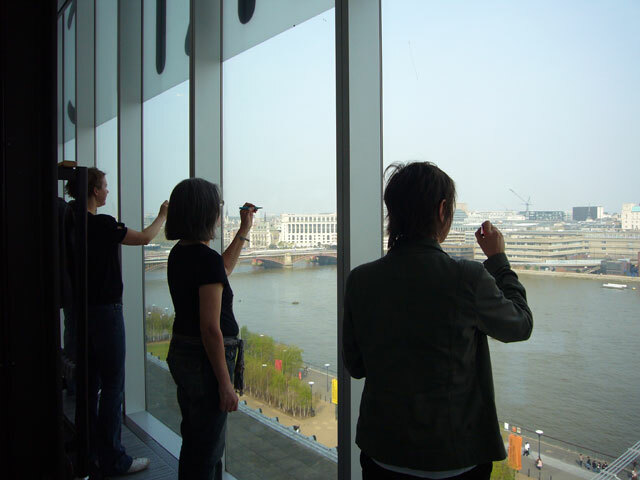 Participants followed people walking on the street, using markers to trace their paths on the glass windows. This exercise played with the idea that a walk is always a line in space and time. Please use the comment box at the foot of this post to add your thoughts, or describe the drawing you created. (Unfortunately, the drawings had been wiped off the glass when I returned to the East Room after the workshop, and I was unable to document them. If someone took pictures, please forward them. 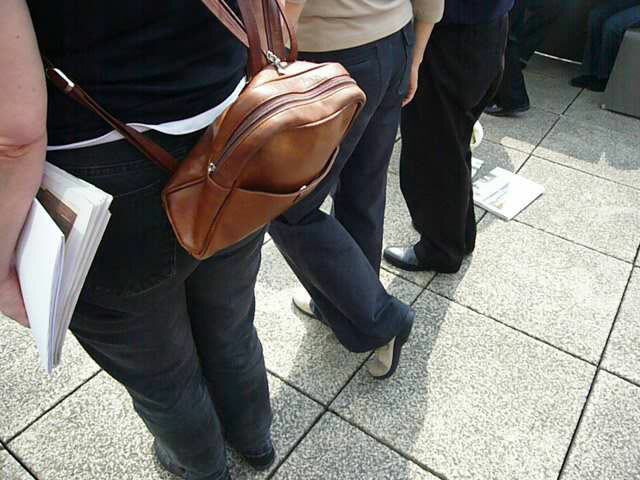 There was a difference in speed of drawing, depending on people’s trajectories. 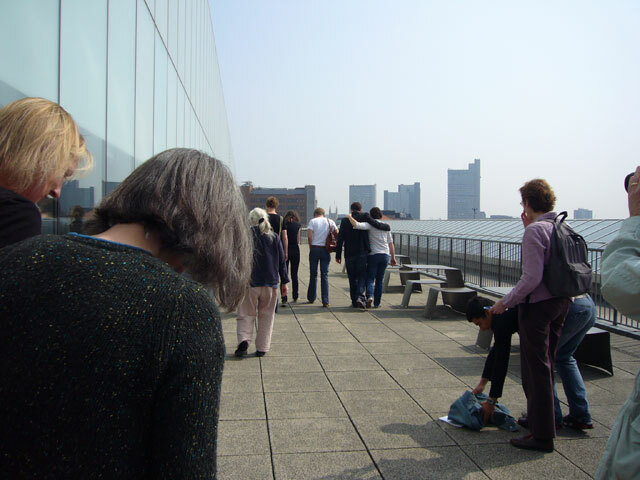 Those walking North-South (on the Millenium Bridge) required slow drawing, whilst the marks following people moving East-West were faster. 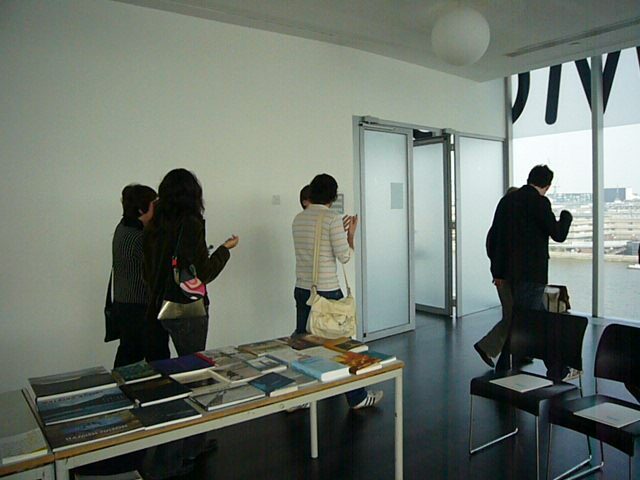 Some drawings stretched quickly over several window panes, following people walking hastily. 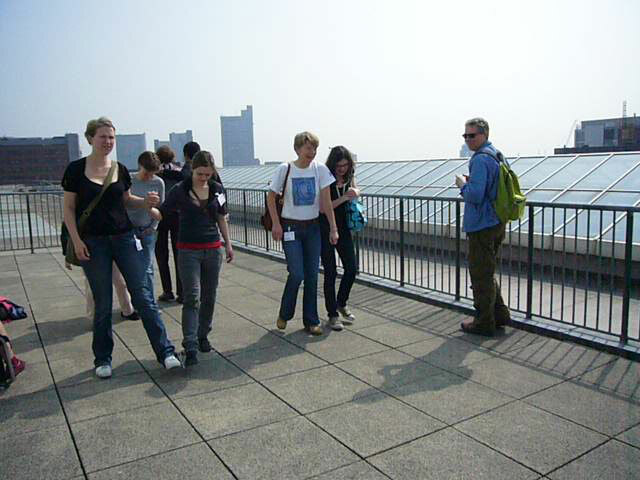 Could people perhaps sense they were being observed, there were being “followed” from up above? 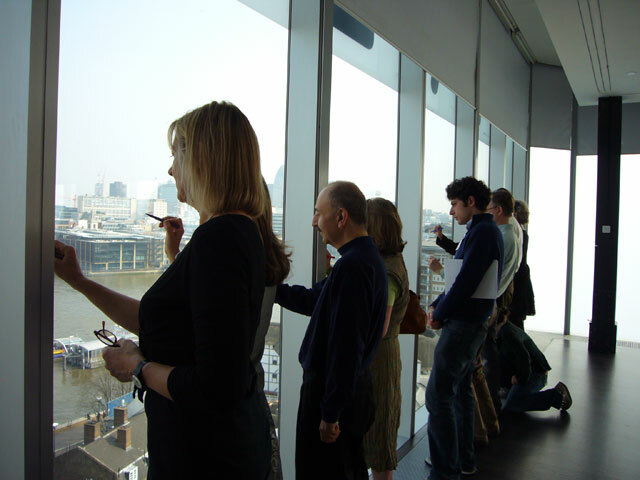 In moments it almost felt that the people walking below were being pushed by the pen. Each person’s gait is unique, almost like a signature. 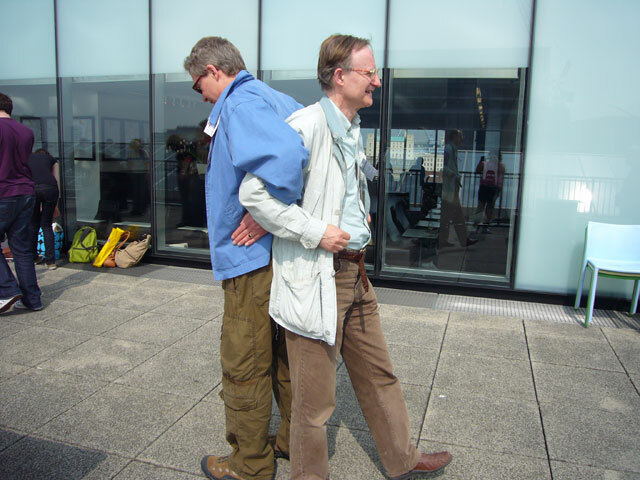 Arms movements are easier to follow than legs movements, although one tends to associate walking with legs rather than arms. Several people followed arm movement, resulting in jittery lines. Others choose to draw and follow people’s shadows, or to take “stills” of the walker’s body, creating sequenced drawings in the manner of Muybridge images of human movement. There is something voyeuristic in following people in this way, some people felt that it was almost like getting involved in their lives. Finding out who they were meeting, and where their walking was taking them. Choosing who to follow was made mainly instinctively. Some people decided to follow walkers with a distinctive appearance (wearing orange for example) as it would be easier to follow them for a long time. 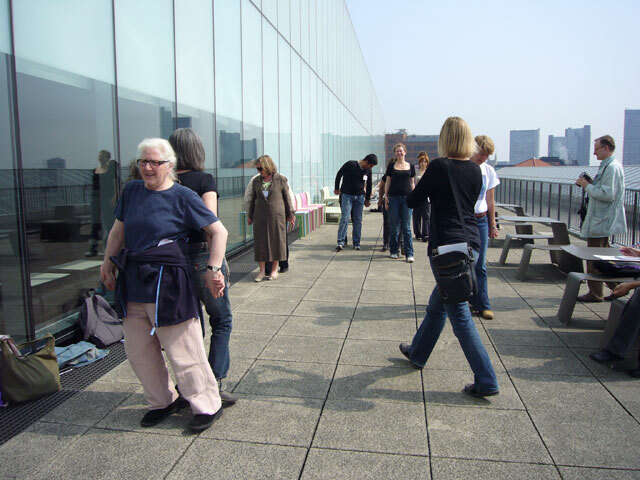 Taking advantage of the great weather, we moved to the terrace of the Member’s area, to try out a few walking experiments. 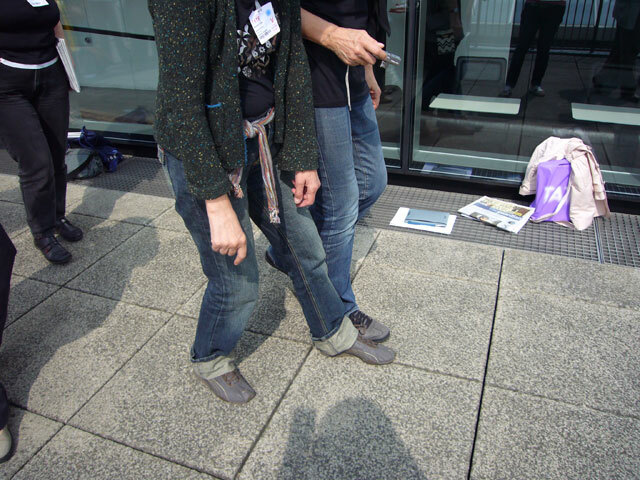 All the participants that had shoes with laces were invited to tie themselves in pairs (as in the children’s game Three-legged race), and try to walk to the end of the terrace and back. 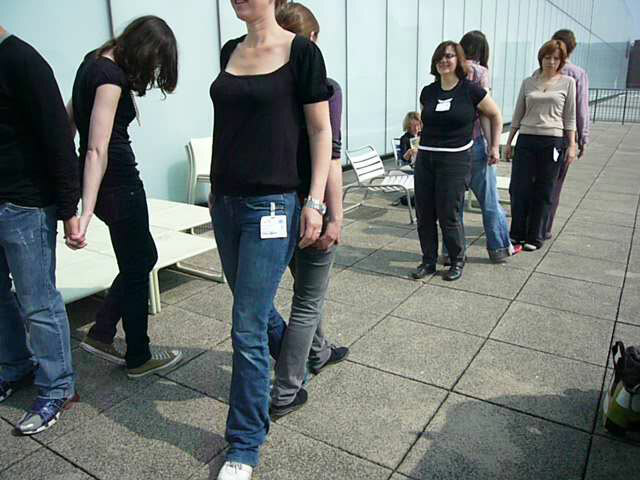 This exercise was adapted from of a piece entitled Three Legged Walk, by Ana Laura Lopez de la Torre and Richard Owen, created for a performance show at Milch Gallery in 1998. 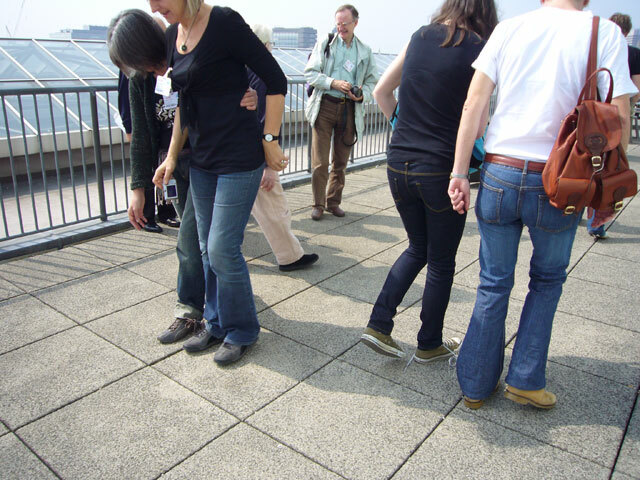 A circular walk in the area surrounding the gallery, by a man and a woman carefully matching their step as if their shoe-laces were tied together. Please use the comment box at the foot of this post to add your thoughts, or describe your experience of this exercise. 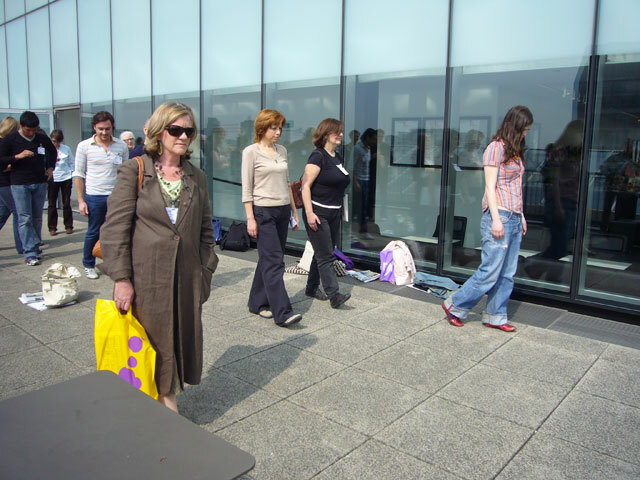 Another group of workshop participants volunteered to walk as slowly as they possibly could. 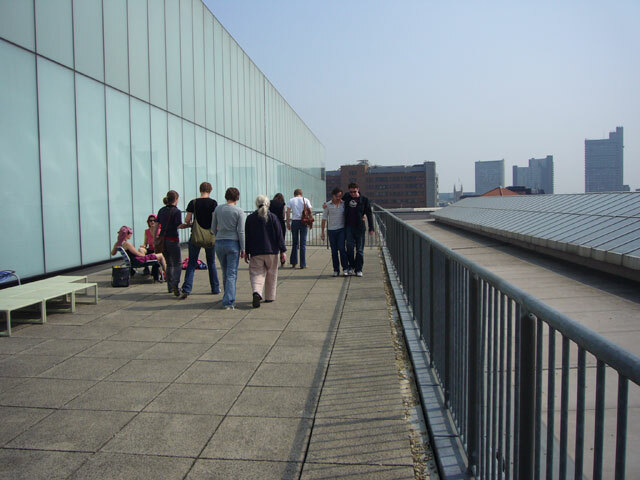 Their instinctive response was to take the shortest possible steps in order to slow down. They were then asked to try to achieve the same effect whilst taking longer, normal strides, but moving all parts of the body very slowly. Some of those who were not doing the exercise followed the walkers taking pictures. It was very beautiful to see the slow photographers following the slow walkers. This exercise was inspired by Ohad Fishof’s Slow Walk piece, that saw him taking a whooping 9 hours, 43 minutes and 25 seconds to cross London Bridge. Visit his website, that has also a nice list of links to slow living. 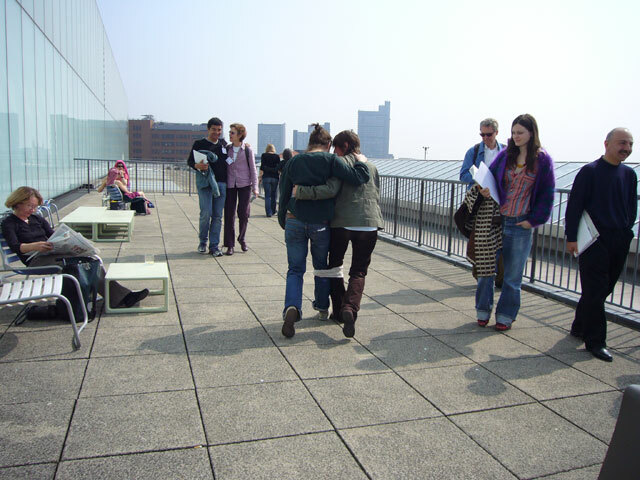 Again in pairs, but this time back to back, participants tried to traverse the terrace back and forth without knocking each other to the ground. 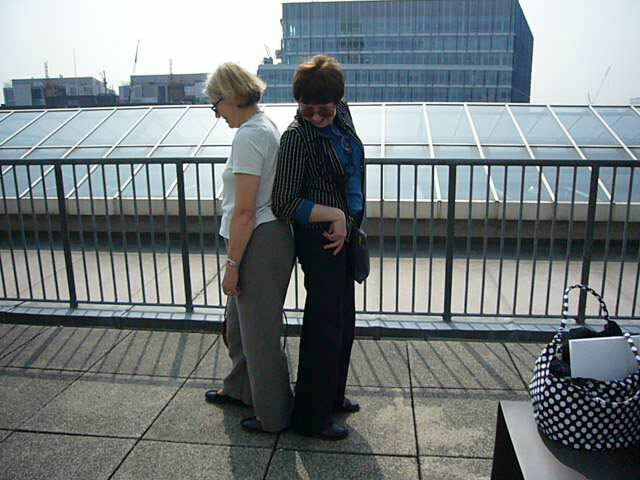 At this stage, two ladies that were having coffee in the terrace, decided to join in and did the Three-legged walk skirting through the back to back walkers. How hard is not to actually look at the work. It was also difficult not to read words on display signs. Someone mentioned that in fact this testified to the good design of museum architecture, that is precisely created to make you look at the work. 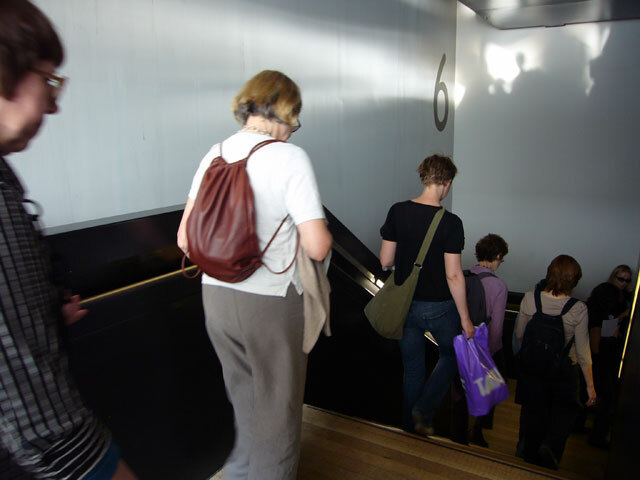 Another participant decided to only look down to the floor, or up to the ceiling during her walk, as a way of avoiding the temptation of looking at the work. The word gallery was originally used to designate long corridors built into palaces to allow for indoor constitutional walks in foul weather. These spaces were in time used also to display paintings, so it was an interesting fact that the art gallery and walking had this old linkage. The first department store in Paris was called Bon Marche, meaning Pleasant Walk. 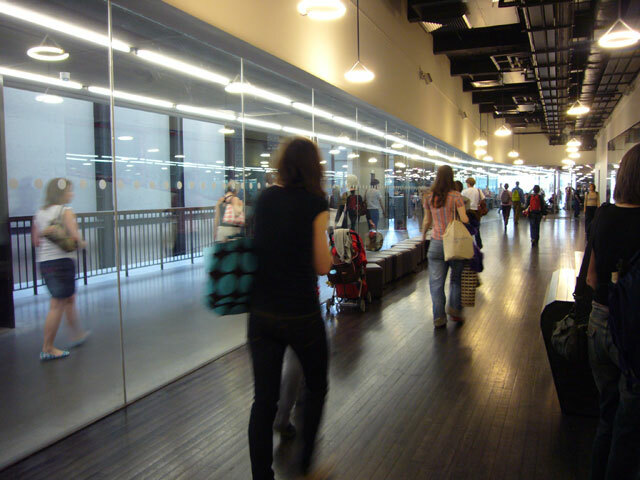 It seems that both art galleries and department stores have their names linked to safe and pleasant walking, so it was perhaps only a matter of time for large art galleries and trendy department stores to develop very similar architectural, social and operational features. 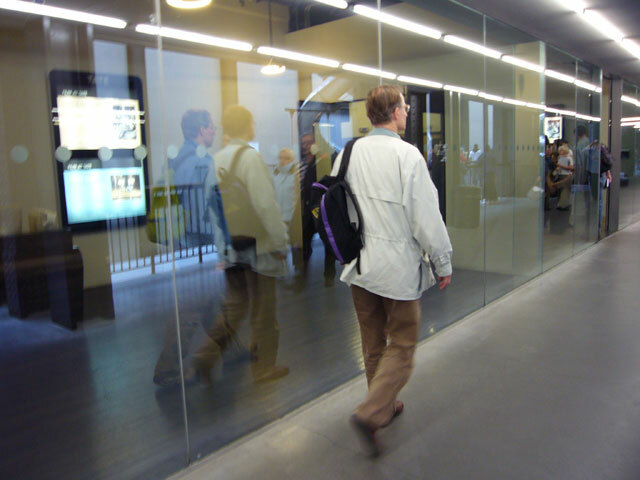 On level 1 of the gallery we took advantage of two parallel corridors separated by one-way mirror glass, to practice a more interactive form of walking. 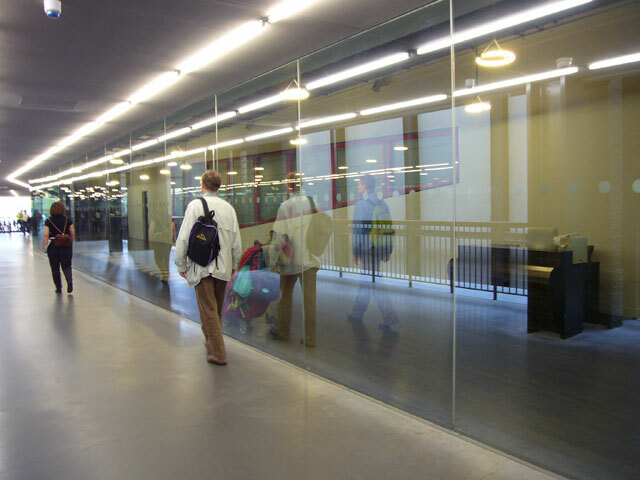 Participants lined up at one of end of the corridor and waited for someone to enter the corridor on the other side of the mirror. 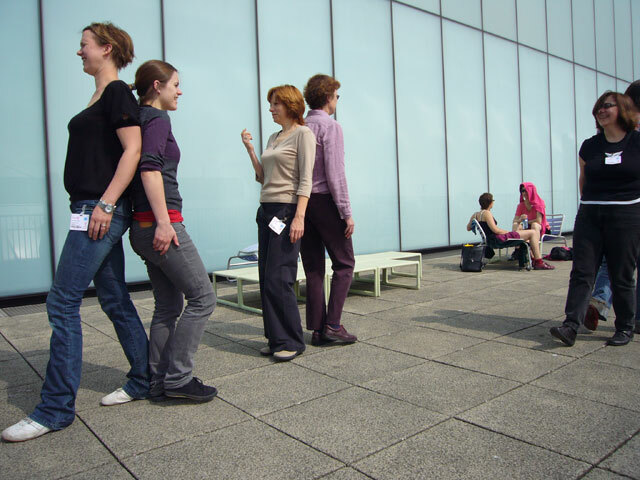 The task was then to match the person’s step and gait whilst avoiding eye contact so as not to obviously alert them to what was happening. 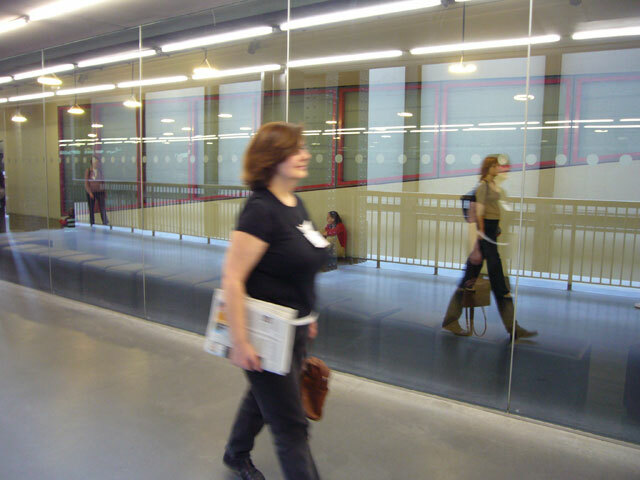 One the reflective side of the glass, you could see the two walkers side by side, plus a reflected third “ghost” walker. 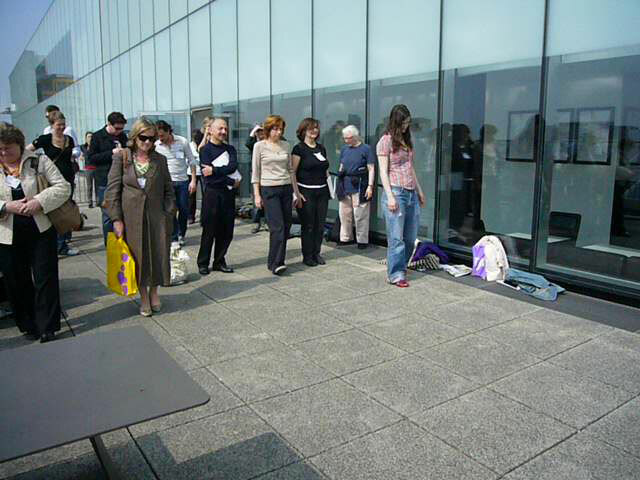 This exercise was a bit chaotic as the flow of people was very irregular and the group got dispersed. 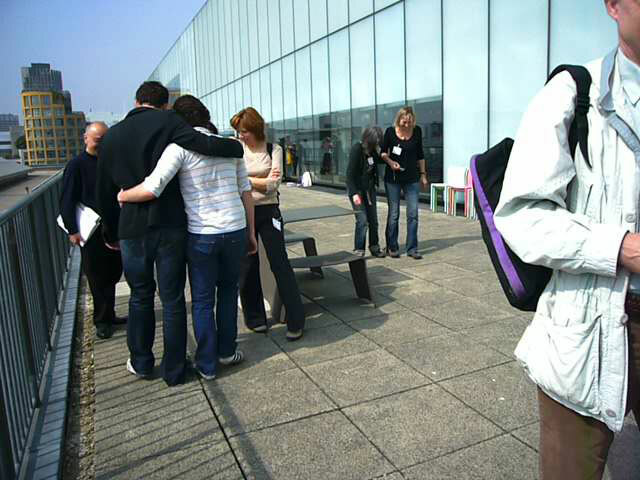 It was interesting to see that some of the participants that had paired to work together in previous exercises, choose freely to do this exercise together instead of mirroring a stranger.